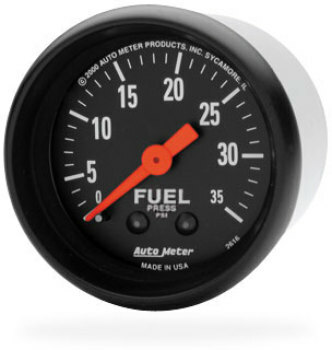 Over the years we've seen Ultra Low Sulfur Diesel (ULSD) fuel play havoc with some of the electrical fuel pressure sending units causing headaches for truck owners who have installed these type gauges. Consequently, the electric units have crept up in price to deal with the fuel issues. 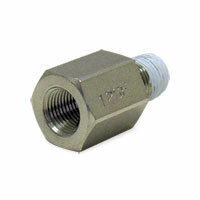 A mechanical fuel pressure gauge provides a direct link to the fuel using only fluid to measure the fuel pressure. It does not have an electrical sending unit that over time is prone to failure. We've been working to solve this problem and together with Auto Meter, we now offer this Z-Series 0-35 PSI mechanical fuel pressure gauge. The gauge includes a pressure isolator to keep the diesel fuel under the hood and an eight foot tubing kit to connect with your in-cabin gauge. Available only from Geno's Garage. Gauge was just what I wanted for my ppumped 12 valve. Thanks to the gauge I found my fuel pressure was low and unlike the 0-60 or 0-100 gauges this 0-35 is a good useable scale for my needs. The included isolator is good quality. The included hose and the syringe could use some improvement. The syringe was completely useless and the tube kinks very easily. Other than those complaints very good. 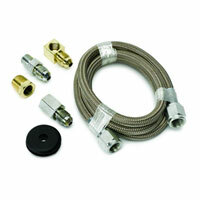 Wish the kit came with fittings/hose for between the fuel filter and isolator. Otherwise a very nice kit.